Age not an issue for Hendren..
YOU DO NOT EXPECT the head men’s basketball coach at any college to greet visitors at the gymnasium door and immediately apologize for being caught up in team laundry duties. Nor do you expect the head men’s basketball coach to insist that he personally buff the gymnasium floor the morning of all home games. Then, again, you do not expect the head men’s basketball coach at any college to be 22 years young. Yet that is Corey Hendren, a 2010 Lexington High graduate who collected his diploma from Milligan (Tenn.) College this past May and, two months later, was named head men’s basketball coach at USC Salkehatchie. 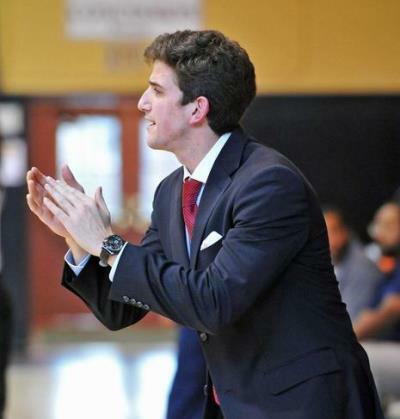 Hendren is believed to be the youngest head men’s basketball coach at any level in the country, at least according to hoopdirt.com, a website that tracks coaching movement in that sport. “It hasn’t been an issue one bit,” said Rob Brendle, USC Salkehatchie’s 43-year-old director of student activities who volunteers as an assistant coach to Hendren. Brendle was coaxed by Hendren into moving his wife and three young children from Milligan College to Walterboro. Brendle was a paid assistant coach at Milligan during Hendren’s four-year playing career. Brendle saw in Hendren a role player on the basketball floor and a role model off the court. Hendren was a three-time member of the conference all-academic team. Brendle says he and Milligan coach Bill Robinson occasionally joked that Hendren would one day have a better job in coaching than either of them. Little did they know how quickly Hendren would land a head coaching job at a junior college. That surprised Hendren, who was given the telephone number this past July and told to call USC Salkehatchie athletics director Jane Brewer. “My initial thought was ‘that’s going to be a short conversation,’ ” Hendren said, referencing his lack of coaching experience. Instead, the two arranged to meet for a barbecue lunch in West Columbia. A two-hour discussion of the job requirements convinced Brewer she had her next head coach. Brewer was USC Salkehatchie’s dean of students before being assigned to the athletics director position six years ago despite no experience in athletics. She since has hired a softball coach – who was 25 at the time – and Hendren, who “looked like a kid,” upon their first meeting. Because the men’s basketball program does not have a paid assistant coach on staff, Brewer knew her new coach would have to possess several qualities: a willingness to tackle all aspects of the job, tremendous organizational skills and a passion for the game. A junior college head coach must conduct all recruitment of players, maintain facilities, run practices, manage the team’s budget, make travel arrangements and schedule games, for starters. To determine the extent of Hendren’s knowledge of the game and his coaching skills, Brewer leaned on his references. Brendle was one, and he told Brewer of how Hendren essentially coached the Milligan junior varsity team as part of an internship during his senior season there. Another reference was Bailey Harris, Hendren’s coach at Lexington High. Harris told Brewer of how Hendren scored 26 points during a nine-minute outburst against Airport High in his first starting assignment as a junior at Lexington High. Hendren, a 6-foot-5 shooting guard, also broke the Great Florida Shootout record of future NBA player Danny Ferry by scoring 19 points in one quarter. But Hendren recognized early on that he was no “superstar” on the court and, instead, turned his eye toward a future in coaching. “Even from an early age, when he wasn’t necessarily one of the better players, you could tell he had that dedication and love of the game,” Harris said. Harris also related to Brewer that his first head-coaching job was the Coastal Carolina women’s team at, believe it or not, age 22. Harris even had a sixth-year senior on his team who was two years older than him. Hendren’s oldest player is 21, but he was a teammate of one of his players on an AAU team in high school. Hendren’s first Salkehatchie club has been hamstrung by having eight home games scheduled this season, but it nonetheless is off to a 12-9 start and in position to challenge for the Region X championship and a spot in the National Junior College Athletic Association tournament. “My short-term goal is winning on Monday,” said Hendren, whose team plays at Denmark Tech, a game in which Harris plans to see his former pupil coach for the first time. Hendren said he might pay tribute to his former coach by draping a towel over his shoulder on the sideline.